Golf is one of only a handful of sports that can be exciting and relaxing at the same time. Every day, thousands of golf players enjoy the activity while spending time with friends and family. To get the most out of golf, it’s important to own a golf push cart. The cart is used to easily transport your clubs and golf balls. Without a cart, it would be very difficult to effectively transport all of the gear that you use while golfing. Fortunately, we’ve picked out the top 10 best golf carts, so you can choose the model that is the best fit for your needs. Strong aluminum frame, weighs less than 18.5 lbs. One of the best products on the market is the CaddyTek EZ-Fold. It features a strong aluminum frame and weighs less than 19 pounds. Since it has a press brake, you can activate the brake by pushing on it. To release the foot brake, all you need to do is press the button again. A one-click button makes it easy to fold the cart in two simple steps. With three EVA wheels, you get the perfect balance between traction and balance, and the wheels can traverse through virtually any type of terrain. There is a patented basket, and it even has a cooler built into it. A mesh net on the handle delivers additional storage, and you get a storage rack and umbrella handle included. 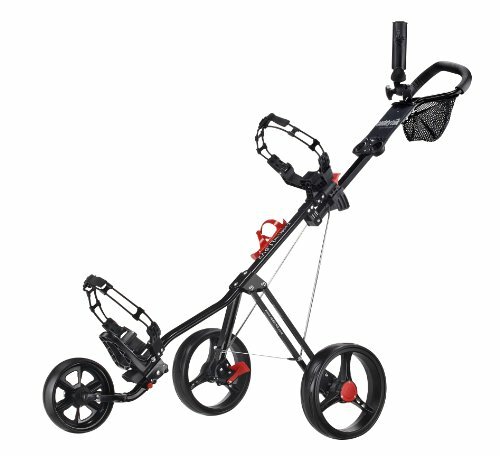 Overall, the CaddyTek EZ-Fold is one of the best golf push carts that you can get for the money. Here is another top golf push cart, and it’s made from the same aluminum that is used to build aircraft. Since it weighs no more than 18 pounds, it won’t force you to push around a heavy, bulky object. The airless tires require no maintenance and can get through most types of terrain. The actual cart is foldable and features a positive lock hand brake. Depending on the style that you choose, the price of this cart can get quite expensive, but it delivers great value for the money. It has a total of three accessory mounts, which are made to support various Clicgear accessories. When you consider the fact that Clicgear has the largest selection of accessories on the market, the accessory mounts might seem even more appealing. If you’re looking for one of the lightest golf push carts on the market, consider the CaddyTek SuperLite Deluxe. It weighs less than 13 pounds, so you can pack it full of gear and not have to worry about it getting too heavy. It comes with an umbrella holder, beverage holder and mesh net. It features a patented foot brake, which makes activating and deactivating the brake much easier. There is a front wheel alignment mechanism built into the cart, so the wheels are aligned automatically. With three durable wheels, you can take this cart almost anywhere. It has almost all of the features that you would get from a much more expensive cart, and you’re only paying about half the price. Another top product from CaddyTek is the Superlite Explorer. Its two-latch mechanism makes the cart very easy to fold, and the overall size of the cart is compact. Even with a strong aluminum frame, this cart doesn’t weigh more than 14 pounds. Unlike other golf push carts on the market, this one has four wheels, and since the wheels don’t require maintenance, you won’t have to sacrifice your precious time to keep them in working condition. 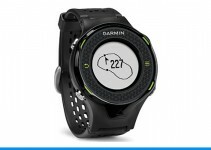 One of the Superlite Explorer’s best features is the distance adjustment. 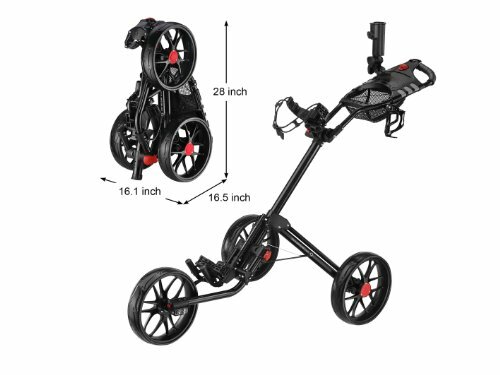 You can adjust the distance between the front wheel and frame, which allows the cart to transport a golf bag of virtually any size. A top product is the Bag Boy Quad. It’s another cart that has four wheels, which gives it unmatched balance and stability. For easy score keeping, it has a deep scorecard holder. It even has spaces to hold a smartphone or golf balls. The support arms are adjustable, so in terms of what the cart can hold, you get even more flexibility. The parking brake is mounted on the handle, which makes braking even easier. The accessory bag is oversized and made from durable mesh. 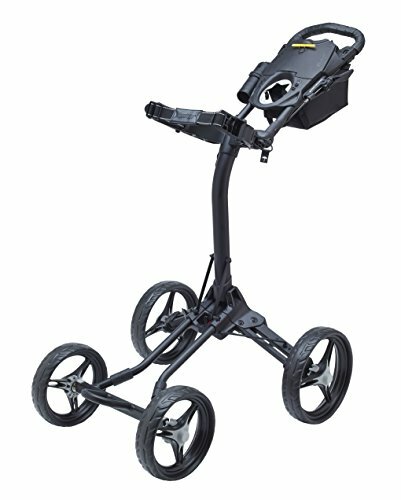 What’s unique about the Bag Boy Quad Plus Golf Push Cart is the fact that it’s received praise from a number of different golf experts. It should be obvious that this is one of the best golf push carts that you can get for the price. If you don’t have a lot of money to spend, and you’re looking for a very basic model, you should consider getting this model. 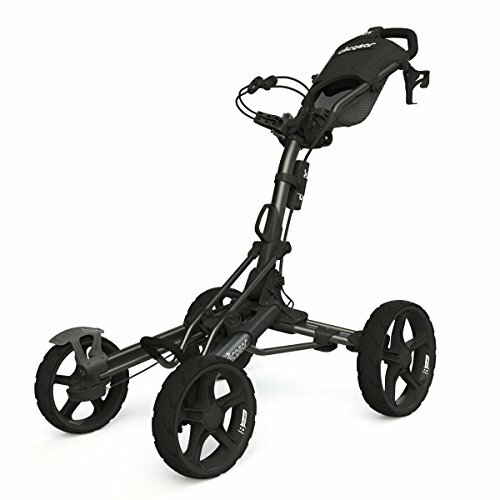 It’s sturdy, lightweight and delivers great mobility on the course. Since it’s made from steel, you can trust that the construction won’t let you down. The whole cart uses a single, fluid motion to open and close. For optimal stability, the cart is equipped with wide wheels. 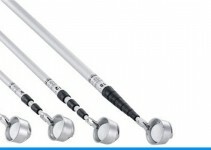 They also feature a clip-on mechanism, which makes removal quick and easy. The scorecard holder is waterproof, and the bottom of the cart is contoured, so it can hold larger bags. If you’re looking for the best basic golf push cart, the Jef World of Golf Deluxe Steel Golf Cart won’t let you down. Here is a model that is incredibly versatile. It features a quad-fold mechanism, which allows you to fold the cart into a very compact shape. To save time, the folding mechanism requires only three steps. It has an aluminum frame and weighs less than 16 pounds. The wheels don’t require maintenance, so you can spend all of your time playing golf. For the easiest pushing, this model has a 28-inch body. You even get a storage rack and umbrella holder, so you can still have plenty of fun on those rainy days. The CaddyLite 15.3 has a scorecard holder built into the design, and there is a storage compartment, mesh net and beverage holder. This particular model is one of the newest designs from CaddyTek, so the company has incorporated features that are based on user feedback. The size of this cart makes it very easy to store inside a trunk, and overall, it offers great value for the money. Its black color makes it very stylish, and it could make other players on the golf course envy you. 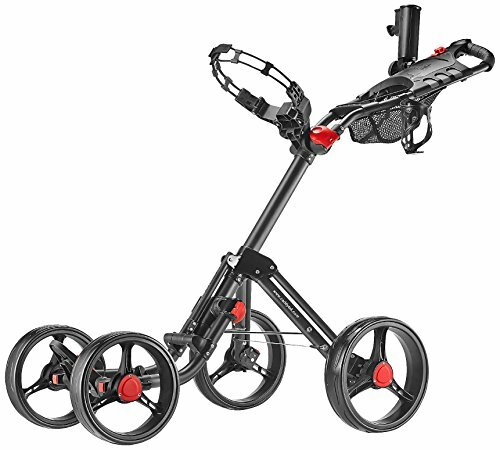 The Tartan Qwik-Fold Golf Cart is a fairly light cart, great for players who spend a lot of time on the course. It is incredibly easy to fold away and weighs in at a meagre 15 lbs. If you’re tired of lugging around a heavy golf bag and have a reasonable budget to spend on a push cart, the Tartan Qwik-Fold Golf Cart could be the perfect model for you. 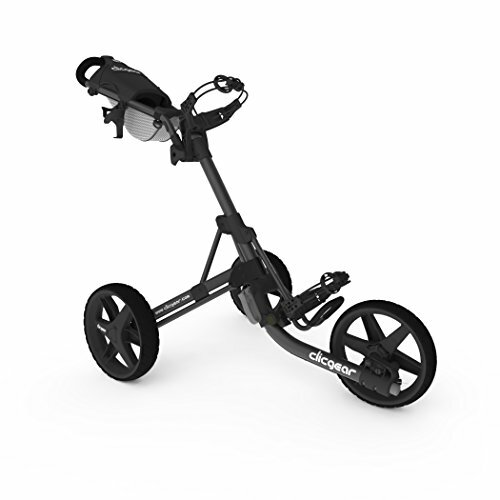 Another great model from Clicgear is the Clicgear Model 8.0 Golf Cart. For unmatched durability, it’s made from oversized aluminum tubing. The console on this model is much larger than on most other push carts, and it even has a magnetic lid, which makes the lid easy to lock into place. It has adjustable bag straps and bag saddle. Since this cart is made from the same grade of aluminum that is used to make airplanes, you can trust that the construction won’t fail. The airless tires require no maintenance and make it easy to transport the cart anywhere on the course. To help you enjoy golf during any weather conditions, the Clicgear Model 8.0 Golf Cart has an umbrella holder and cup holder. There are six accessory mounts, so you can purchase and use a wide range of accessories with this cart. A bag strap storage clip makes it even easier to carry a large golf bag. Although this model is quite a bit more expensive than other carts, it delivers more features and premium construction. If you’re looking for a golf push cart that is affordable and well-made, the Spin It GCPro II Push Golf Cart could be the model you’ve been looking for. To make the folding process effortless, it features a one-click folding mechanism. It has three airless tires, so you never have to worry about adding air, and the tires require almost no maintenance. 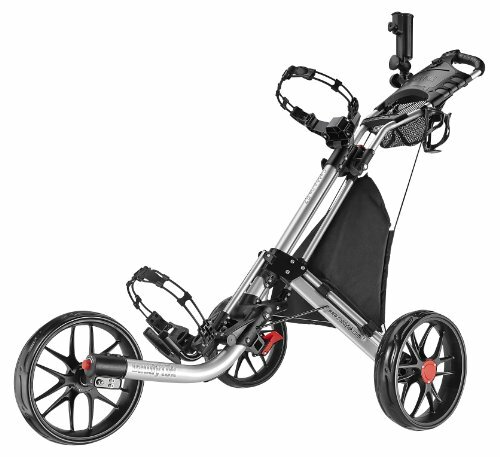 When compared with other golf push carts, this model has the fastest folding mechanism available. It features a lightweight aluminum frame, adjustable handle and easy-to-use foot brake. 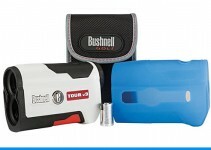 You even get an umbrella holder, drink holder, storage compartment and scorecard holder. If you’re looking for one of the best golf push carts on the market, the Spin It Golf Products GCPro II Push Golf Cart won’t let you down. Price – Decide how much money you want to spend! There are a lot of golf push carts out there. You need to decide if you are wanting the perks of a high-end model, the cost-effectiveness of a mid-ranged model or the value of a low-end model. High-end golf push carts come with all the bells and whistles, but they can cost more than $200. Electric models can run up to $900. 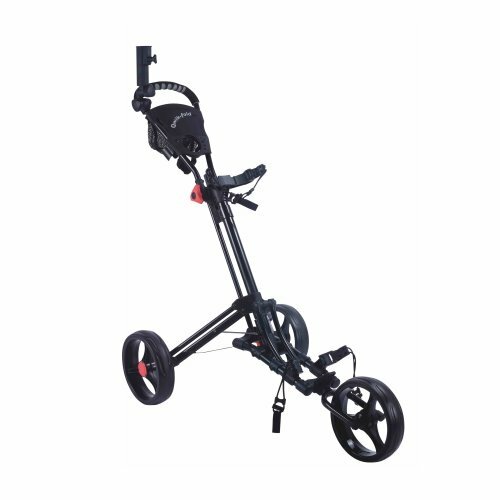 Middle of the road push carts can run between $75-$150. Inexpensive models are usually less than $50. Remember, you often get what you pay for – so figure out what’s most important to you and your golf game. Storage – How much room do you have to store your golf push cart? Do you need it to fit inside a small vehicle or closet? Figure out if the push cart folds to a desirable size. Some carts offer one-click button folding, while others have more complicated procedures. Ratings and Reviews – Do your research! What are other golfers saying about the product? When browsing shopping sites, be sure to check out the ratings for the push golf cart you are interested in. What problems are people having with the product? Has the company responded to online complaints? This could tell you a good deal about customer service at the company you plan to purchase from – were you to have any problems with the product after purchase. Amenities – There are a lot of options out there for golf push carts these days. You have to decide what you need and what you can live without. Examples of amenities include golf ball storage, adjustable handles, mobile device holders, beverage holders, scorecard consoles, storage racks, sand bottles, steering knobs and attachable seats. Color Selection – Some golf push carts come in standard black/charcoal, and others come in all colors of the rainbow. If you are looking for a cart that matches your personality and style, be sure to look at the color options. Bag Straps – If you tend to store a lot of golf balls, tees, jackets and other items in your bag, chances are it’s pretty heavy. Be sure you get a push golf cart that has the strap strength to hold it in place. How much weight can the push golf cart hold? Also, be sure to see how many straps it has for your bag. If there is only one strap to hold the bag in place, it might not be enough. Some carts don’t have straps at all – using support arms to hold the bag in place. Brakes – If you play on a hilly course, brakes are going to be very important on your push golf cart. Many carts offer hand brakes, but some of the more inexpensive models only have foot breaks. If you are buying online, see if other golfers had trouble locking and unlocking the brakes. If you are buying it in person, be sure to check out the braking system yourself. Assembly – Some push golf cart models are simple to put together. Other models are a bit more complicated. If you aren’t very handy, you might steer clear of models that have more than a step or two for assembly.